Syrian Democratic Forces freed more than 2,000 civilian hostages. BEIRUT (Reuters) - U.S.-backed forces have seized full control of the northern Syrian city ofManbij near the Turkish border after the last remaining Islamic State fighters, who had been using civilians as human shields, left, a spokesman for the group said Friday. Syria Democratic Forces (SDF) were now sweeping the city after the departure of a last remaining group of militants who had been holed up in the city. They had freed over 2,000 civilian hostages who had been held by the militants, Sharfan Darwish of the SDF allied ManbijMilitary Council told Reuters. “The city is now fully under our control but we are undertaking sweeping operations,” Darwish said, adding militant sleeper cells in the city were still a threat. The SDF’s offensive, which began at the end of May, aims to remove Islamic State from areas it controls along the Turkish border. The Manbij operation in which U.S. special forces have played a significant role on the ground marks the most ambitious advance by a group allied to Washington in Syria since the United States launched its military campaign against Islamic State two years ago. Manbij’s loss to the militants is a big blow as it is of strategic importance, serving as a conduit for transit of foreign jihadists and provisions coming from the Turkish border. Syria Democratic Forces, backed by the U.S., announced Friday they have claimed control of Syria's Manbij from the so-called Islamic State. More than 2,000 hostages were freed. Darwish said earlier roughly 100 Islamic State fighters were left in the city center using civilians as human shields, some of whom were killed trying to flee. Reuters pictures showed residents being released from an Islamic State-held neighborhood on Friday and being welcomed by SDF forces. 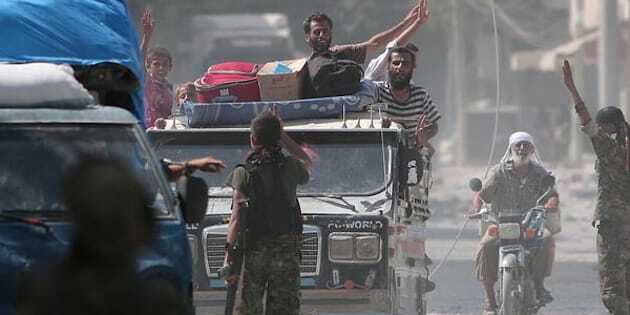 Kurdish sources and the Syrian Observatory for Human Rights, which monitors Syria’s five-year-old conflict, later said around 500 cars had left Manbij carrying Islamic State members and civilians. They were heading northeast towards Jarablus, a town under Islamic State control on the Turkish border, the Observatory said. The convoy carried the final Islamic State members leaving the city, under an agreement between the fighting parties that would not be announced officially, Kurdish sources and the monitor said, marking the end of the operation. The SDF’s campaign quickly captured the countryside surrounding Manbij, but slowed once fighting entered the city. The SDF said it had been avoiding a large-scale assault inside Manbijout of concern for civilians. Dozens of civilians, including children and women from Manbij who had fled the city at the height of the aerial strikes, were killed in suspected U.S. coalition air strikes last month, residents and monitors said. U.S. officials have said once the Manbij operation is completed, it would create the conditions to move on the militant group’s de facto capital of Raqqa. U.S. officials anticipate a tough battle.